Dry lips are for the birds! Peeling and cracking, no thank you. Keep your pout moisturized without shelling over a lot of dough. 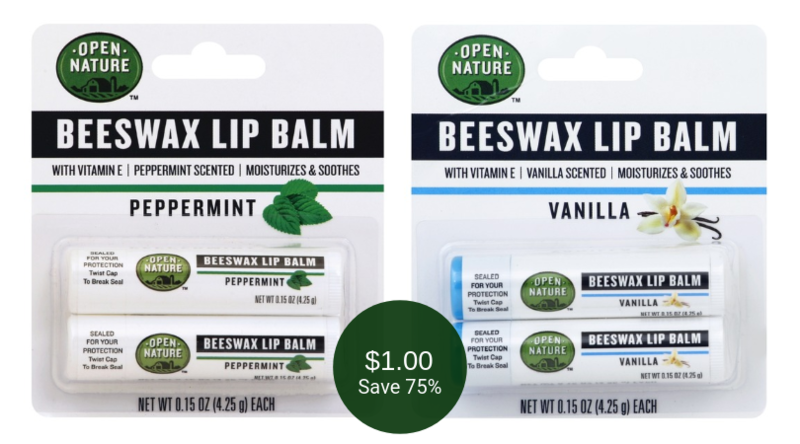 While you are shopping at Safeway through April 2nd, pick up Open Nature Beeswax Lip Balm 2 packs for $1.00 each after the sale price. That is a HOT savings of 75%! Plus, no coupons are required in order to save at the register. It’s a win/win scenario, especially perfect for novice savers. Are you looking for more ways to save? Check out the Safeway weekly ad & coupon preview here. Plus, check out 15 ways to save at Safeway. Final price = $1.00 for a twin pack – $0.50 per tube, save 75%!